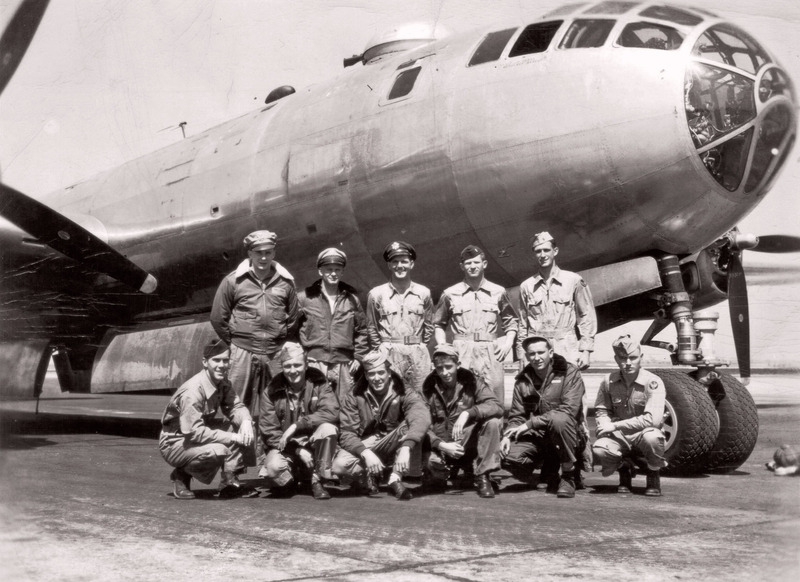 It was near the end of World War Two and my father’s cousin, Ed Pugsley, and his squadron were being briefed about their next bombing mission in their B-29. The co-pilot and his crew were part of a mission to bomb an oil refinery north of Osaka, a mere 8.5 hours and 1,500 miles away in what was their 16th bombing mission. But if the surrender came while the crew was in-flight, they would receive the special radio code “Utah! Utah! Utah!” and they were to turn around and come home after dumping their bombs at sea. “You never saw so many guys pressing their ears against their head sets,” Ed told his son. Staying focused to the mission, the crew found their target and headed home, perhaps disappointed that the call didn’t come. But about one hour into the return flight, the call came into the headsets–“Utah, Utah, Utah”. I can imagine the relief that the war was finally over, but this battle wasn’t over for the crew. As Ed later explained, the most notable accomplishment was that in terms of time and distance, this was the longest propeller driven combat strike in the history of the world. “We were in the air 17 hours and 15 minutes. Traveled close to three thousand miles. When we got back to base we landed on fumes,” Ed explained. This was officially the last mission of World War Two. Ed was 19 at the time. Ed died earlier this year, and his story was captured by his son Don at his eulogy. Like so many in this “Greatest Generation“, Ed was strong and brave, but to me he was an incredible leader. This Memorial Day, I thought about Ed and his team–what it was like, how they felt, what scared them, how they worked together, and what they talked about. I can’t even imagine being in their shoes, at their age, and doing the things they were doing for our country. All I can say is thank you for your service. This entry was posted in Appreciation, Leadership, Leadership Impressions and tagged World War Two on May 29, 2018 by omarreece.